Like today, the summer months of a century ago were no stranger to hot spells in the Greater Lowell area either. One particular hot spell, during the middle of July in 1910, was said to be ‘hotter than the hobs of Hades’, as it was reported by Oscar, a popular downtown Lowell personality who worked at Putnam’s restaurant in Merrimack (now Kearney) Square. By the hot spell’s second day, on July 11, 1910, Lowell residents rejoiced as they were cooled by a gracious, if not refreshing, northwest wind that brought the temperature down a few precious degrees. But, even though the northwest wind had brought the 100°F temperature down a meaningful 8°F, it was still an oppressive 92°F in the shade at Lowell’s Pawtucket Boulevard. At the height of the spell on the day before, the temperature had reached a hot 96°F at the Concord drug store in Belvidere. The city farm near the Chelmsford town line recorded a temperature of 98°F. That heat, recorded on July 10, 1910, was said to be the hottest in 30 years. And, the hottest temperatures ever recorded in Lowell up to that time, 102°F, were noted on that day at two spots, Gallagher’s Tobacco Store on Merrimack Street and the Merrimack Woolen Mills at the Navy Yard. So, what did people do, in an age before air conditioning, to escape the heat? Whatever they could. The Lowell Fire Department helped in the effort to keep people cool, by wetting down the roads twice per day, flushing the unhealthy dust from the air. The 7 o’clock wetting each evening was the most popular. While wetting down the roads, the fire department was known to also wet down the roofs and sides of houses too. As they dispersed through the city to spray down the streets, they were greeted in a variety of languages. Children followed the watering cart, to keep their legs wet. Wearing little more than a smile, they played in the muddy streams that had replaced the hot, dusty roads. The bravest among them approached the firemen’s hoses even though the streams of water emerging from them were capable of knocking a small child a great distance. By Tuesday of that week of the hot spell, the weather began to cool, to 88°F. When the street-wetting visits by the firemen were still hours away, people waited (and prayed) for passing showers. During the mid-July 1910 heat wave, Tyngsboro was the only Greater Lowell community visited by a shower. Portsmouth, NH was also visited by a strong thunder shower. Both had attracted so much attention that they were recorded in the Lowell Sun the next day. Not everyone hated the heat waves. Lowell’s soda fountains and ice cream shops did a brisk business with those seeking a brief respite from the heat. And the street railway welcomed the extra fare-paying passengers who could not or would not walk. All sought to escape the unhealthful city air during the hot spell. Many who could escape fled to the beaches on the north or south shores. Those who were too poor to afford travel swarmed the beaches of the city’s Merrimack and Concord Rivers. Others sought out the amusement parks along the street railway – Canobie Lake, Lakeview and Willow Dale, all of which were heavily visited. Salisbury beach, Hampton Beach, Lynn beach, Revere, Marblehead, Nahant, and Nantasket were all popular destinations too. 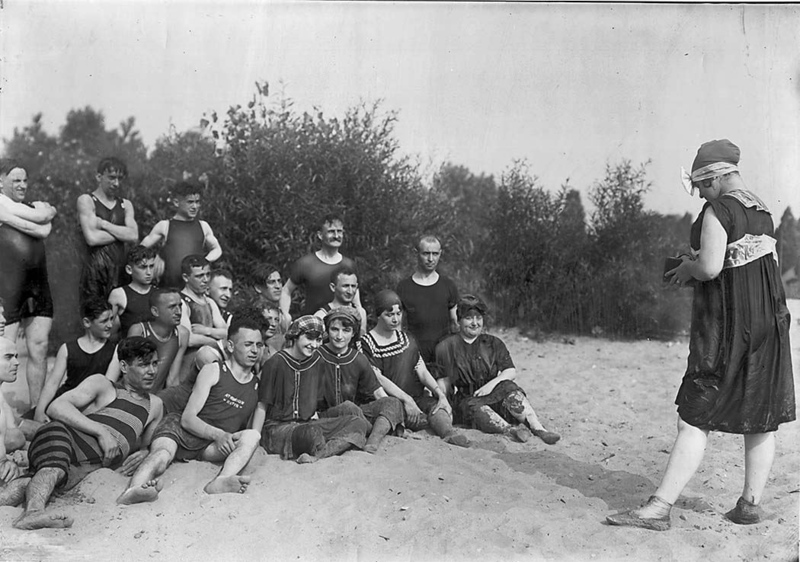 Lowell residents often found their neighbors and co-workers at the beach. To escape the city and get to the beach was difficult. Some relied on the electric cars to get to Salisbury Beach or Hampton Beach, but the ride was cumbersome, lengthy, and not well-loved. On Sundays, no train ran from Lowell to Salisbury or Newburyport. Instead, Lowellians needed to take a car that would get them to Lawrence in time for the 8:20 AM train that left there for Salisbury, a trip that cost 55 cents. Even on an 8:20 AM train, you wouldn’t expect to arrive at Salisbury until 80 minutes later, at 9:40. Meanwhile, those trapped in Lowell’s tenements would often find themselves on their doorsteps, unable to withstand the heat inside their buildings. Others would crowd the city’s commons or Fort Hill park, jockeying for prime positions on the park’s limited benches. And they had to contend with one of the era’s most annoying pests, the brown-tail moth. Brown-Tail Moths were associated with the hot spells of a century ago. The moths were an invasive species accidentally introduced from Europe only a few years earlier. By the time of the 1910 heat wave, the moths were a common pest who invaded at times of high heat. Often seen on the Chelmsford Street electric cars, the pests would fly into the faces of the motormen and the passengers, causing the cars to run more slowly. Contact with the brown-tail moth caused an irritation similar to poison ivy and could be particularly severe in some people. Hot spells were dangerous. In the two-and-a-half days from Saturday to noon on Monday, 30 deaths were recorded in the Lowell area due to heat. A significant amount, 11, were infants and children under 5 years of age. One day later, by noon on Tuesday, 11 more had died, for a total of 41 deaths due to the heat wave. Four more of those deaths were children under 5. The others were older patients who doctors said would have lived, if not for the extreme heat. One of the groups most seriously at risk was the men who worked the streets, cleaning and maintaining them. Most had grown accustomed to the weather over the course of their lives. One key survival trick? They would wear wet cabbage leaves under their hats so that “sun won’t affect the brain”. They also drank oatmeal water to “keep their stomachs in order”. Advice of the day warned against drinking ice water or swimming in very cold water when overheated. The shock to the system was unhealthy. Women in the mills, too, were frequently overcome at their work and had to be carried outside to the open air. And, lastly, the children who carried lunch pails to their parents and relatives in the mills were frequently overcome by the unforgiving midday heat. One hundred years ago, hot spells were a matter of life or death, literally. Much advice was provided for avoiding the perils of ‘heat prostration‘, which is today better known as ‘heat exhaustion’. In July 1901, The Western Druggist advised its readers to eat a light, nutritious diet. That meant no sweets, no pastry, no fats, and no heavy dinners. Instead, readers were to eat lean meats, fresh fruits, vegetables, and fish. The Western Druggist admonished its readers to pace themselves and take a couple of hours off in the middle of the day for a siesta, like those in the ‘hot countries’. Also, readers wishing to avoid heat prostration were told to avoid alcohol and other stimulants. Most sunstroke, it was reported, was caused by those who had become drunk on beer, whiskey, or other alcoholic drinks. And last, milk was to be sterilized and kept on ice before it was given to children. The Western Druggist then went on to advise city-dwellers to spend time in the public parks. The air, it was said, had been cleansed by the trees of ‘carbonic acid’ and purified with oxygen. And, according to the common knowledge of the time, the air in a wooded area was actually colder, due to the average mean temperature of growing trees being just 54°F. Love the details…the moths, the cabbage leaves, – and the word picture of Lowellians following the water trucks for a bit of relief! The details were interesting to come across as I wrote this post. I hadn’t thought of so many people spending nights on their fire escapes and in the city’s parks due to the excessive heat inside their homes. I knew an old timer who worked on the roads way back when. He was almost 95 when he died and drank “oatmeal water” when the temps rose. Maybe they were on to something?? Maybe they were – not sure if I’ll be trying it soon, though! We complain about hot weather now, but back then, with no AC, it must have been much worse– and consider also that deodorant and antiperspirants weren’t in use at that time, ugh! I didn’t know that the fire dept would wet down streets and houses, though– that must have helped a bit.